The Catholic Enquiry Centre has unveiled a fresh, new ‘Catholic Discovery’ brand as it seeks to engage with new audiences, including those with and without Christian Faith, those active in the Church and those who have left, inviting them all to discover more about our community and the Church today. Last year, the NZ Catholic Bishops Conference set out a new mandate for CEC to explore new avenues including a greater social media presence and collaboration with individual and collective leadership in parish and school communities. The directive builds on the legacy of over 50 years of the Centre’s work in bringing alive the beliefs and practices of the Catholic faith to New Zealanders. The Catholic Enquiry Centre (CEC), now 50 years old, is trying to share its message of hope in a raft of new ways. Just recently Pope Francis issued a Pastoral letter on holiness: Gaudete et Exsultate, Rejoice and Be Glad. He restates three leading themes that have dominated his five years as leader of the Catholic Church. He insists every Catholic is called to holiness, that each of us is called to carry the gospel to places where the Church’s voice is unheard – and that each one of us is to do so in ways unique to our personal history and talents (GS, 1,2,11). In 2017 the New Zealand Catholic bishops remodelled the CEC in an effort to meet these goals. The Centre was to continue its role of sending out information and booklets to those seeking deeper understanding, even admission, to the Church. They also wanted to reach out to former Catholics, to the almost 50 per cent who describe themselves as having no religion, and the 80 per cent of young adults who gather their information through cell phone, tablet or computer. As the new pastoral director I, and Joe Serci an expert in digital platforms and social media, were asked to take on this task. From the start of 2018 several initiatives have been launched. The former website (www.catholicenquiry.nz) remains to serve as a reference point for the many faithful people who support us with their prayers and donations. 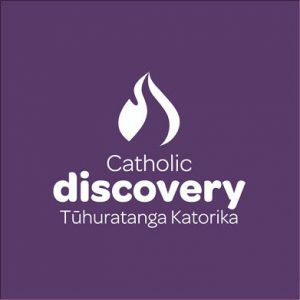 The Catholic Enquiry Centre will continue doing its good work but, to help us with our mission, we are releasing new branding for Catholic Discovery – Tūhuratanga Katorika. The new branding better communicates the process of learning about our faith. It offers a vibrant visual feel to help us attract our target audience. 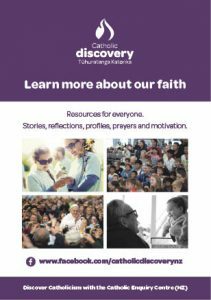 On our website there is a link to our new Facebook page, Catholic Discovery (www.facebook.com/catholicdiscovery.nz). From the start of the year we have worked hard to post up dozens of faith-related posts: prayers, reflections, interviews and pictures, which we believe would be of wide interest. A video interview with new bishop, Paul Martin, drew many viewers. Reflections for every Sunday and feast day have drawn a steady following, while a spiritual touch to public events such as World Environment Day and Samoan language week have drawn appreciative comments. In the next few weeks we will also be launching out on Twitter and be posting our new logo. This icon, evocative of flame, path and dove (all ancient symbols of Catholic faith), is coloured a deep purple, a reminder of Christ’s sufferings. One of the main aims of these changes is to reach out and link many units of our faith. We would love to carry inspiring stories from our local heroes and accounts of the work of our many pastoral workers. We want to carry inspiring stories from our parishes. We are working closely with Catholic Communications and the Bishops’ Conference to bring a strong and unified vision of what our Catholic faith can still bring to New Zealand life. Already we have attracted hundreds of new followers, many from outside our land. We need your presence and help too. Please visit our Facebook page, give it a ‘like’ and share it with your friends and acquaintances. You can also help us with content. Let us know your story and what inspires you within our faith. Become one of those active and mission minded Catholics whom Pope Francis is inspiring and drawing forth. You can contact us at info@catholicenquiry.nz or ph (04) 385-8518.